You are at:Home»Air Conditioner»Air Conditioner Stopped Working? You know that dreaded feeling – it’s usually happens in the middle of a Raleigh heat wave … Your air conditioner stops working and it’s no longer cooling your home home. 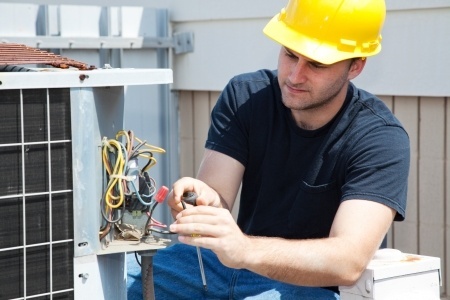 Don’t fret – before you call a Raleigh HVAC technician, take these steps to determine if it is something simple you can fix or if you need to call a local HVAC technician. Turn the air conditioning unit completely off and then back on and check to see if air conditioning unit now works. Check your homes main circuit breaker inside your home and your outdoor unit – Check to see if both are in the “on” position and reset them if needed. Turn you air conditioner back on again as see if it now works. Check your thermostat and make sure the batteries are still good, if unsure, replace them and see if that fixes your issue. If you’re looking for Air Conditioning repair in the Raleigh, Cary, Holly Springs or surrounding areas – we are open 7 Days a Week!